Chapter 2. The following article represents excerpts taken from the Blog (http://www.flicka20-wookie.com/) written by Chris Vassiliou. This information can only be published with permission given in writing by Chris Vassiliou. No changes can be made without the written consent of Chris Vassiliou. No publisher has the exclusive rights to this information. This information is distributed to several editorial magazines for printing. 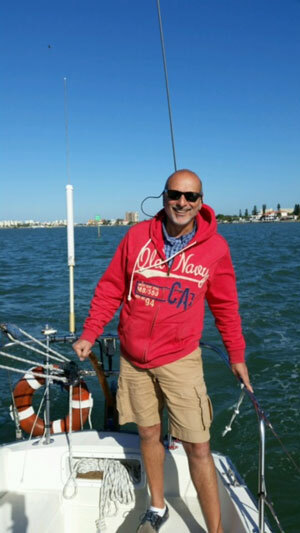 My ideas of a simple restoration project while living aboard in beautiful St. Petersburg, Florida was not to be. 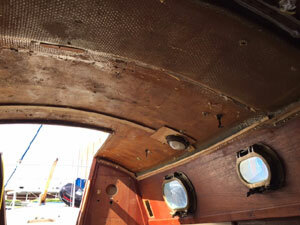 The more I got to know about the boat the more I realized I would never be happy with her unless there was some major restoration done to her interior. It was a beautiful starry night at the boat-yard – around midnight – my fellow live-aboards were fast asleep close by in what was soon to be my marina. I sat next to my little vessel and dreamt of what she could be. It was at this point I made the grand decision to restore Wookie to a simple high-quality pocket cruiser. A boat whose interior glowed with varnish and bronze lit by a few lights and an oil lamp. Gone would be the vinyl ceiling and carpeted sides all replaced by teak that was warm and inviting. I wanted her external hardware to be simple and easy to use especially as the boat had such small sails. Just as importantly I wanted her navigation equipment to be minimal. All I needed was a good compass, handheld VHF radio, a portable GPS unit augmented by good old fashion book charts and for all those shallow bays, a depth sounder. Satisfied I had made the right decision I went to my Jeep and crawled in content but exhausted (my home while looking for a boat). I slept soundly and was woken when one of the yard staff banged on my door holding a cup of coffee for me. The first step was to get the hull below the waterline to a point that I felt safe and secure. Removing the old above water line plastic through-hulls including the cockpit scuppers and replacing these with bronze fittings. Installing new scuppers, bilge hoses and stainless steel clamps. Removing all the old transducers and seacocks not being used and fiber-glassing these holes (by the time I left the yard the only hole below the waterline was the seacock for the galley sink). 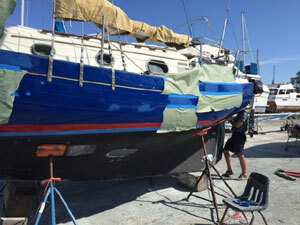 Sanding and prepping the hull for several new coats of bottom paint (Black Sea Hawk Biocap TF 1205-1 Antifouling Paint). 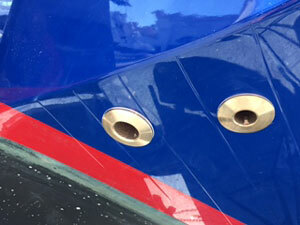 Treating all bronze fittings below the waterline (rudder gudgeons and grounding plate). Removing the old name and registration numbers off the hull. Painting any areas of the hull above the waterline that had been scraped. Repairing any scratches in the red waterline mark. 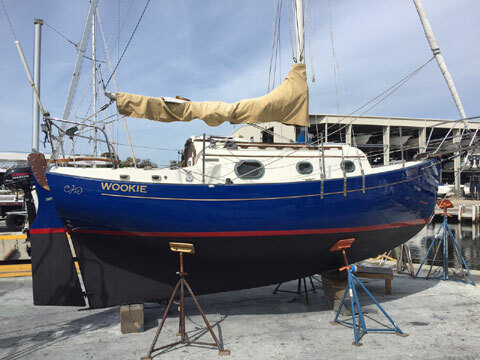 By the time the work was completed at the boat yard, Wookie glowed and had become a bit of an attraction. Truly, how can any sailor not be impressed with the lovely hull lines of a Flicka..well done Bruce Bingham! After a couple of weeks I was finally able to dock the boat at its berth. The Harborage Marina has excellent floating docks and within walking distance of beautiful downtown St. Petersburg. This was a great place to spend time during the day dismantling all the unnecessary hardware on Wookie’s deck and getting rid of the interior's wiring, old equipment, outlet boxes, lights, hooks, screws and the myriad of items that I considered to be junk. Most evenings I spent walking along the waterfront by the beautiful Vinoy Renaissance Hotel and the many amazing restaurants where one can really indulge in some excellent delectables. Enjoying a cold glass of beer or a rose on a balmy afternoon while watching locals and tourists wandering by was relaxing. I used this time to evaluate my daily progress and study the pictures representing the host of new projects that kept springing up. I divided the projects that needed to be done into sections, being careful to remove items so that I could understand their function and more importantly to get a deeper understanding of how the boat was put together. The first thing I did was to identify where all the leaks were coming from. I got on and off the boat on that side. For a solid week I placed a hose on different parts of the boat and sat inside until I was able to identify the various channels these leaks travelled along. I discovered five deck fittings (2 at the bowsprit and 3 around the mast) that leaked in addition to several of the portholes. There was also a lot of rust on the bolts associated with the deck jib travelers and one of the stanchion posts on the port side. I sensed these needed to be removed and re-bedded. 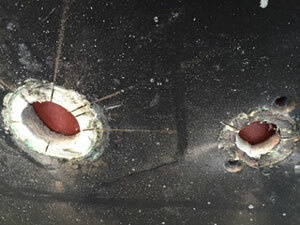 I removed several of the electrical deck fittings and using two-part epoxy thickened with microfibers I filled these holes and faired them over. The portholes that leaked (as a temporary fix) I opened these and ran a bead of black silicone around the gasket. I then gently and evenly tightened the ports shut. I wiped off the excess silicon and after an hour I sprayed them with water to see if they still leaked. I found this method effective but obviously it meant they could not be opened again until the gaskets were replaced. The wiring I removed carefully at first with some degree of care so as to determine where it all originated and at which terminal it ended up. Eventually this fruitless gesture was abandoned and instead energies were focused at removing everything out of the boat. Amazingly I filled six large trash bags of wiring from this 20 foot sailboat. Removing the carpet was an interesting exercise. I have to admit I began this task with quite a bit of trepidation as one realizes that once this process is started there is no going back. Even more worrisome, was the fear I would not be able to get it all off especially in those many tight corners i.e. inside areas of the sail locker and galley locker. My tools to tackle this task consisted of a sharp knife to cut the carpet into sections making it easier to pull on, and a pair of pliers. 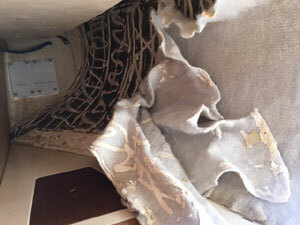 The process was simple enough; grab a section of carpet with the pliers and pull hard. In this manner I was able to pull back between 3 to 6 inches of carpet at a time. A tedious task, however, 5 hours later I finally sat back looked at my handy work and nursed a pair of blistered hands. To my relief the carpet was finally all off and even though the hull was now bare and exposed, it felt great to get this moldy old stuff out of Wookie. Removing the vinyl liner was a lot simpler than the carpet. However, I did discover that years of drilling holes in the cabin top of the Flicka meant that between the ceiling and liner lay a treasure of fiberglass powder. The first section I cut and sliced back resulted in me being bathed in dust. This found its way into my eyes and removed the shine from my bald head, finally settling all over the interior of the boat. Consequently, I changed tactics slicing a small section then inserting the nozzle end of my vacuum cleaner into this cut. By doing this I was able to vacuum a large amount of the dust before cutting away the vinyl. I expected the foam under the vinyl to be very crumbly but to my surprise this was still intact and sections of this peeled off the fiberglass easily. The edges of the liner were stapled on strips of wood that framed the ceiling. Even though this came off with a pair of pliers rolling this up took a little bit of extra care to prevent my body looking like it had developed some rash acquired in the backwaters of the Zambezi. In about 3 hours I had the liner removed and had cut away all of the loose wires. I did not remove the dome lights or the porthole latches as I wanted to note where these were when the new ceiling was being installed. I found the channeling of the wires interesting and it gave me ideas of how I wanted to do this when my new AC/DC panel was installed. With the carpet and ceiling liner, the electrical wiring, a collection of boxes, lights, outlets and various decorative items all tossed out, Wookie looked refreshingly barren. I now felt I had a good base to start preparing for the fun stuff - the real restoration process.